THE NEWEST VEHICLE FROM MERCEDES-BENZ ISN’T A CAR—OR IS IT? At first there were only rumors. Sightings. Like the monster of Loch Ness. People swore it was out there: a Mercedes S-Class Convertible, not on land but in the shallows, floating in the waters of Côte d’Azur. What to make of this seeming apparition? Did James Bond finally tire of English-made vehicles and instead choose a German hybrid (in the truest sense) for his nautical spy games? Or did a visitor to Monaco, overcome with a lead foot on a narrow turn after watching Formula 1 racing, end up in the drink? 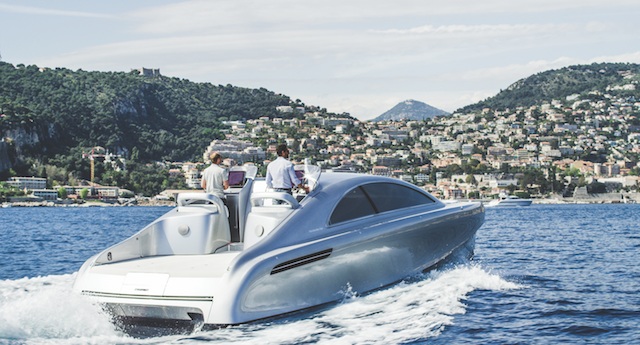 The brainchild of Silver Arrows Marine and the Mercedes-Benz style team (designers of everything from prescription glasses and ambient lights to high-end apartments and helicopters), the collaboration has given us a yacht with classic automobile proportions, bringing the hallmark Mercedes design to the water in a highly dynamic form. People (aka journalists like myself) like to throw around the word avant-garde when describing the seemingly indescribable. Still, if the Arrow460–Granturismo is anything, it’s inventive, original and, sure, avant-garde in an industry that’s only recently begun to explore its creative side. It recalls the floating fortresses and otherworldly super-yacht designs of the late Iranian architect Zaha Hadid. Most of all, though, it evokes Mercedes-Benz’s penchant for platinum curves and a sculptural curvilinear form that at this point are inseparable from the overall design philosophy which has made this company one of the most renowned auto brands in the world. Measuring at just over 46 feet from bow to stern, the Arrow460 is unabashedly compact like an S-Class. As with its four-wheeled brethren, the large side windows are retractable. Plus, the windscreen (i.e., the windshield, if you’re not a yachtsman) can be raised, bringing together the advantages of an open boat with those of a hull cabin cruiser. The crossover design is suitable both for day trips and overnight stays on board. Also: bring friends. The Arrow can accommodate 10 people, perfect for a family jaunt or (if you’re Leonardo DiCaprio) for one of your Victoria’s Secret yacht parties. As you’d expect in a Mercedes, air conditioning and a high-quality stereo are standard. The Arrow comes equipped with extendable tables and beds as well as a luxurious bathroom unit and separate dressing room. There’s a wine cellar and ice machine. Fine-grain eucalyptus wood is used as a floor covering, while the walls are trimmed in flowing wood. Then there’s its exclusivity. The price tag begins at $1.7 million, and so far only 10 have been made, with a limit of one per country. For all intents and purposes, then, the Arrow460 may remain as unseen as the Loch Ness monster. Envy, on the other hand, comes free of charge.